There are many companies producing quality solid state drives these days in various capacities, speeds, and form factors. SATA variants are perfectly fine, but NVMe models are significantly faster. With all brands considered, one company's offerings have stood out among the rest thanks to speed and reliability -- Samsung. Remarkably, the wildly popular company's storage drives are competitively priced too, making them an absolute no-brainer. Today, Samsung launches its latest solid state drive. The "970 EVO Plus," as it is called, is an upgrade to the standard 970 EVO. Not only do you get increased speed, but improved power efficiency too. "By integrating the company's most advanced V-NAND chips with optimized firmware, the 970 EVO Plus achieves significant performance improvements -- up to 53 percent in write speed -- as well as increased power efficiency over its predecessor, the 970 EVO. The new drive delivers sequential read and write speeds of up to 3,500 megabytes per second (MB/s) and up to 3,300 MB/s, respectively, while random speeds come in at up to 620,000 IOPS for read and up to 560,000 IOPS for write operations," explains Samsung. 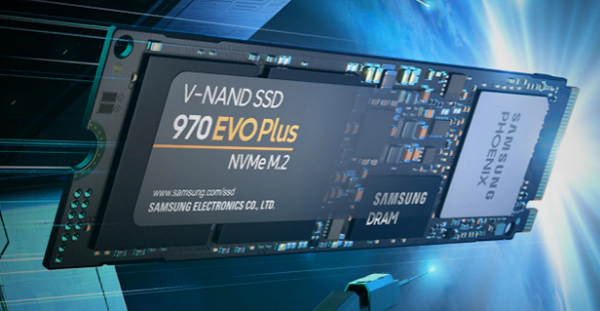 Dr. Mike Mang, vice president of Brand Product Marketing, Memory Business at Samsung Electronics says, "Since introducing the first NVMe SSDs to the consumer market in 2015, Samsung has continued to challenge technical barriers in SSD design and performance. The new 970 EVO Plus powered by Samsung's latest fifth-generation V-NAND technology will now offer unrivaled performance in its class when taking on demanding tasks like 4K content editing, 3D modeling and simulation as well as heavy gaming." Samsung shares the 970 EVO Plus specs below, plus a side-by-side comparison to the non-plus model. If you want to buy your own 970 EVO Plus, you won't have to wait long. The 256GB, 512GB, and 1TB capacities will hit stores imminently, with pricing starting at just $89.99. The 2TB model, however, won't be available until April for an undisclosed price.